Last month, we saw Shin Hye on "Infinity Challenge" trying out for their cheering squad to cheer for the South Korean soccer team at the World Cup in Brazil. In the latest episode, Shin Hye was asked to join the team. Shin Hye signed a contract to join if the South Korean team made it to the semifinals. Because the World Cup has just begun, we will have to see if Shin Hye will indeed join the "Infinity Challenge" team in Brazil to cheer for team South Korea. 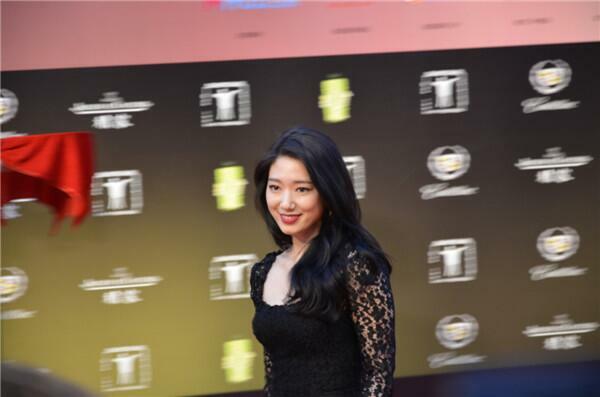 Park Shin Hye, along with several well known Korean actors and actresses, was invited to attend the 17th Shanghai International Film Festival in Shanghai, China. She left Korea and was welcome enthusiastically by her Chinese fans at the airport and those waiting for her at the event. She arrived at the venue looking elegantly dressed in a black lace dress. I don't know about you, but she killed during the red carpet. She was absolutely gorgeous! Here are of Shin Hye departing Seoul and arriving in Shanghai. Always the fashionista, she matched her pale pink lace skirt with a simple white blouse. Stunning!